Keeping your horse in top form is easy with supplements from Pasturas Los Alazanes. HealthyCoat® by Healthy Coat is an all-natural supplement comprised of Omega 3 and Omega 6 essential fatty acids used to promote horse health and increase performance. 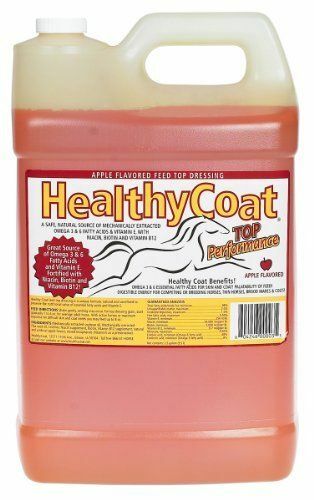 HealthyCoat® is a highly digestible source of Omega 3 & 6 essential fatty acids, Vitamin E and Lecithin, fortified with Niacin, Biotin and Vitamin B12. Symptoms of fatty acid deficiency include dry skin, brittle or cracked hooves, dull hair, skin conditions, allergies, inflammation of the joints, arthritis, reproduction problems, laminitis, brian and nervous disorders, and below normal performance. Supplementing with HealthyCoat® will promote optimum health for your horse. Just add 2 ounces to your horses feed daily to promote a beautifully conditioned hair coat. The gallon size provides up to a 2 month supply for one horse. Healthy Coat comes in three sizes and is available at Pasturas Los Alazanes in Dallas, Texas. This entry was posted on Tuesday, August 18th, 2015 at 3:45 pm	and is filed under Horses, News & Updates. You can follow any responses to this entry through the RSS 2.0 feed. You can leave a response, or trackback from your own site.